Once you've read all the cartoons on this page, you can see more by clicking the "Older Posts" link near the bottom of the page. 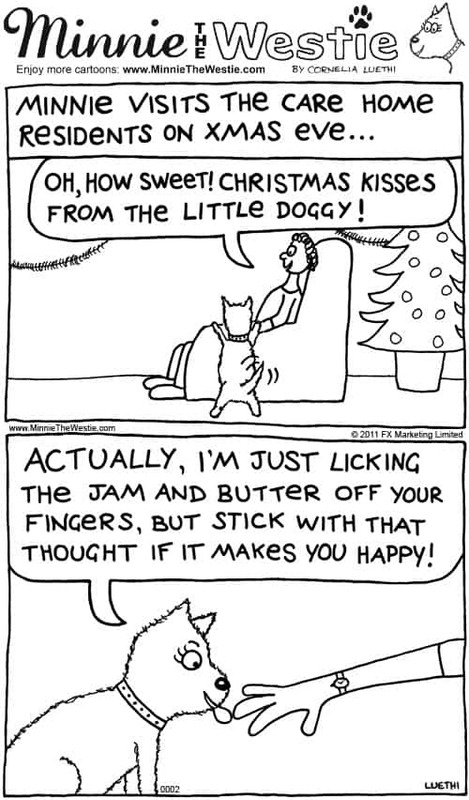 Cartoon of the month: Never say no to a pawresent! The humans are also rushing around getting work finished and pawresents bought before something called “Christmas”… I have no idea what that is (I’m a dog after all! 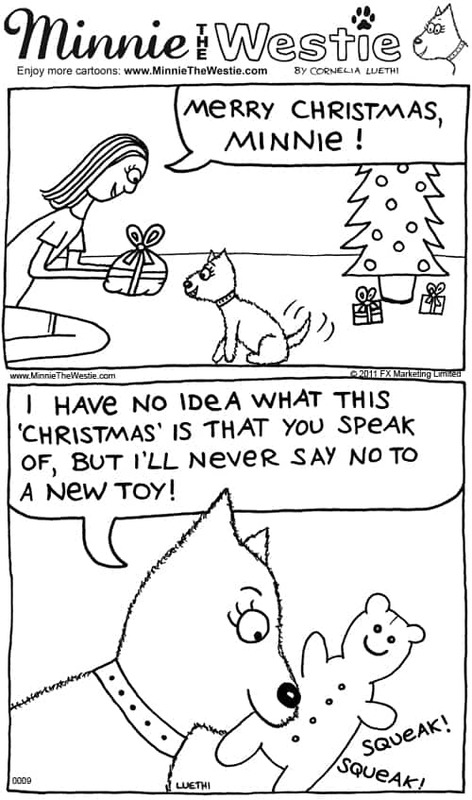 ), but I’ll never say now to nice pawresent, as you can see in this month’s Minnie the Westie cartoon! PS. 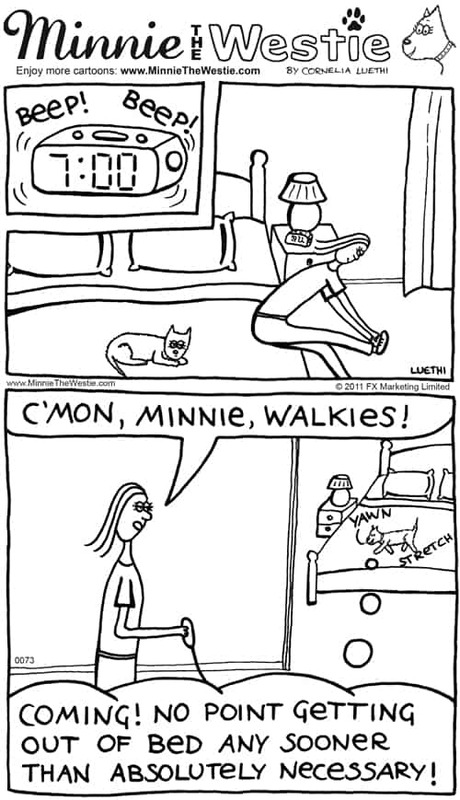 Would you like to use Minnie The Westie cartoons? Click here to read about cartoon licensing. Hint: using my westie cartoons is free for non-commercial blogs and organisations such as dog clubs and dog rescues! Westie cartoon: pawsome time management! What is your dog like in the morning? Does your dog leap out of bed, raring to go… or is it like me, and stays in bed right until the last pawssible moment?! Me, I love being all nice ‘n’ comfy in bed. I have my time management down to pawfection, and arrive at the front door just in time for my morning walk… but not a moment sooner than necessary! PS. 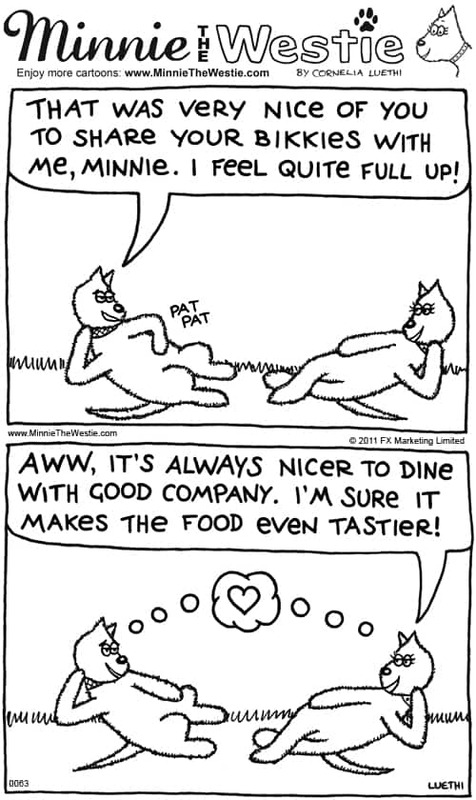 Would you like to use Minnie The Westie dog cartoons? Click here to read about cartoon licensing. 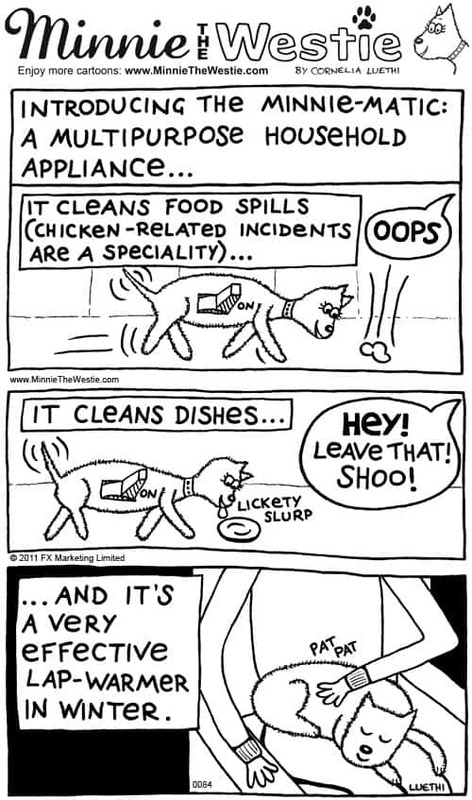 Hint: using my dog cartoons is free for non-commercial blogs and organisations such as dog clubs and dog rescues! Westie Cartoon: Rain doesn’t stop doggy playtime! It’s spring-time here in New Zealand, and that means lots of spring rain showers. I hope you have lots of playtime too, whatever the weather! 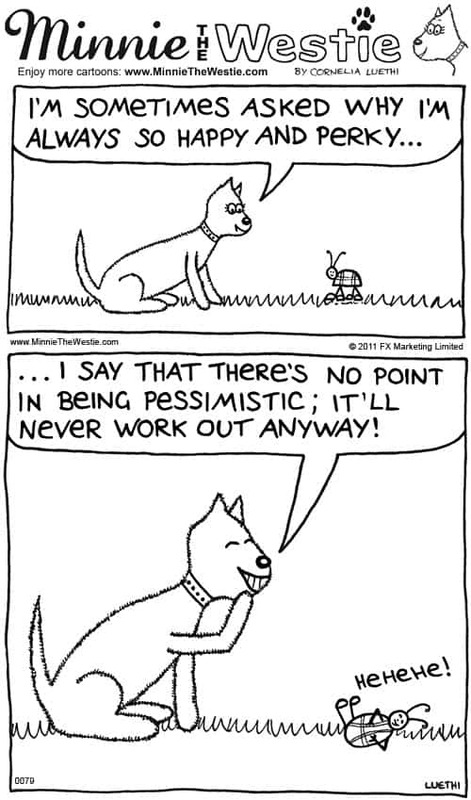 Cartoon of the month: Why are Westies always so happy? I hope you have a happy month too! 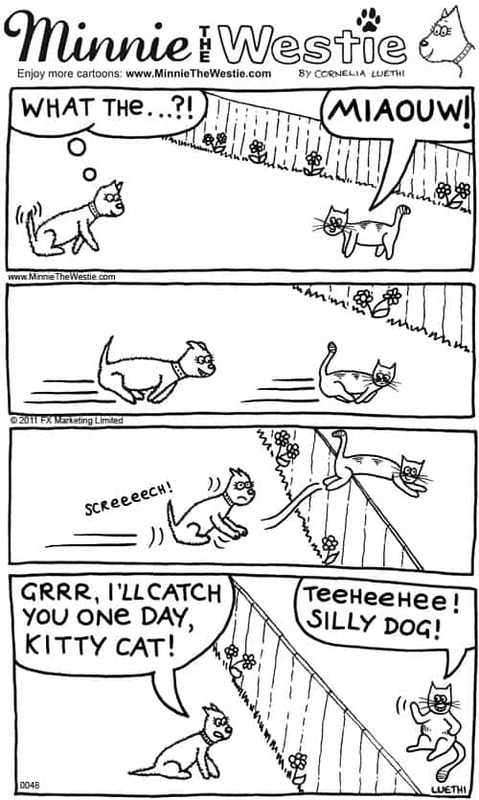 Cartoon of the month: Do you chase cats? Let’s talk about one of my favourite topics: cats. My motto is: if it runs, then chase it! Till next time! Have fun out there! In case you’re wondering, one of my nicknames at home really is “Minnie-Matic”! And as you can see, Minnie-Matic has many uses! Till next time! I hope you manage to score some bonus noms too! Brrrr, the 1st of June is officially the first day of winter here in New Zealand, and gosh it’s getting chilly! I do not like the cold, so I’m already wearing my woolly jumper sometimes on my walks. Winter’s not all bad though, as it’s a great excuse for extra cuddles! The upsides of winter are there if you look for them! Till next time! I hope you’re nice ‘n’ warm ‘n’ toasty where you are! 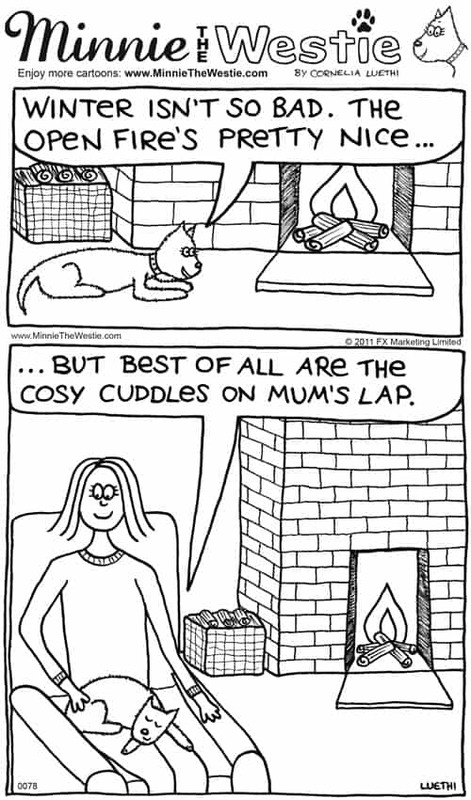 Some of my cartoons are about my doggy care home visits. Mum and I do make such visits: we visit a local care home every two weeks, and we’ve been doing that for nearly two years. These doggy care home visits are so much fun! I get so many pats and chin rubs, I just love the attention! This cartoon is true: some of the residents have very tasty hands after they’ve eaten their morning tea snack! Till next time! I hope you get lots of pats and tasty treats too! 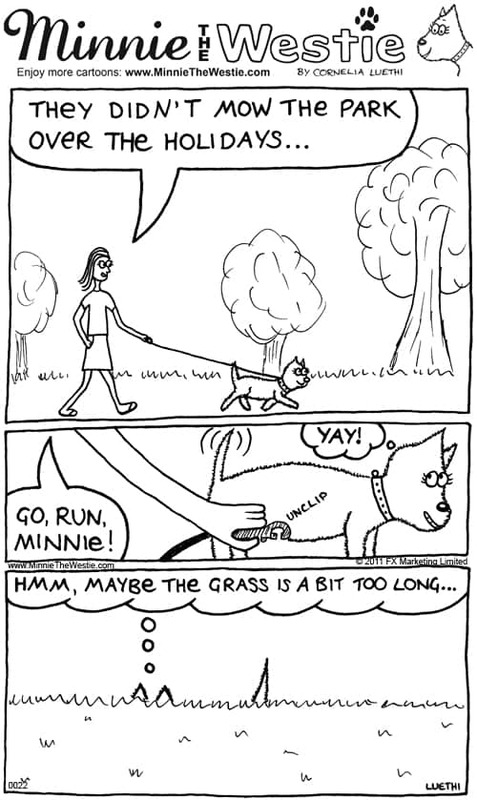 Cartoon of the month: Long grass + little legs = a challenge! It’s now Autumn here in New Zealand, and the last month or so has been very rainy. Lots of rain means that the grass in the park grows very fast: plus the park is often too boggy and water-logged to be mowed. So the grass gets longer and longer. This long grass can be challenging for those of us with little legs! I am very grateful that mum and dad usually keep me on a lead so I don’t get lost! Yes, I celebrated it and shared my dog bikkies with my boyfriend, Morris! One furiend pointed out to me that EVERY day is Dog Biscuit Appreciation Day for them, and I think that is very true! So if you missed out on bikkies on 23rd February, just have some noms now – they will taste just as good! Just remember that good company makes food tastier, so share some with your furiends!